It was like something out of a movie. Blakely Mattern was picking up her journal one day in 2014 when a newspaper clipping slipped out of its pages. It was a small article she’d cut out months before from The Greenville News. Flipping it over, she saw, fitting perfectly in the cut-out square, an advertisement for Clemson’s MBA program. Mattern took it as a sign. A Greenville native, Mattern attended the University of South Carolina on a soccer scholarship and graduated with an international business degree in 2009. She went on to play professional soccer abroad in the Netherlands and Sweden before returning to the U.S. and taking a head trainer position at a gym in Greer. In between playing overseas and nursing an ACL injury, Mattern met India Trotter through a mutual friend. Trotter was the assistant coach for the USC Upstate women’s soccer team at the time but had previously played overseas and on the U.S. women’s national soccer team. While playing on various teams and coaching different groups, both Mattern and Trotter discovered a need in the young soccer community: comprehensive, supplementary soccer training. In addition to regular practice, girls were paying monthly gym memberships to keep up their strength and were also seeing trainers or personal coaches for technique and speed work. While Trotter was coaching and Mattern was training at the gym, the beginnings of a business model were taking shape. Soon after, Mattern began to think of grad school, and the fateful newspaper clipping practically fell into her lap. She decided to pursue her MBA at Clemson, a decision that would help to catapult 11.11 Training from a developing idea to a full-fledged business. 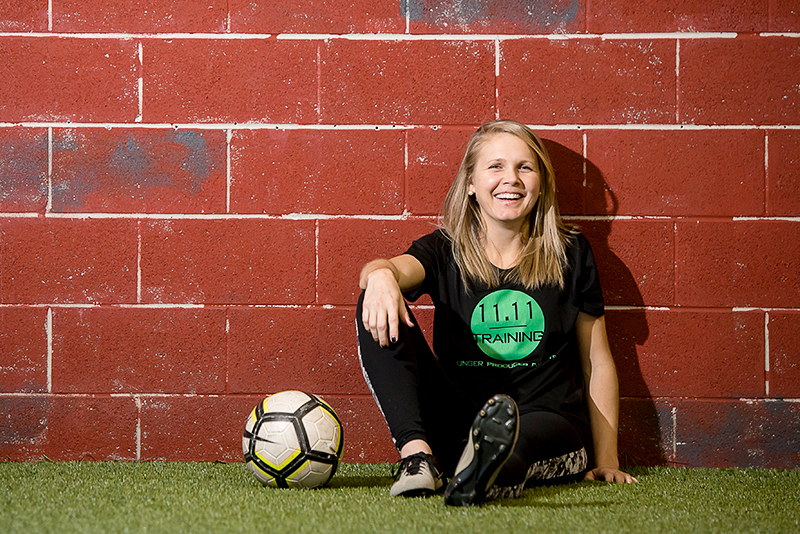 11.11 Training, cofounded by Mattern and Trotter in 2016, is an all-inclusive soccer training facility for girls in the Upstate. Ages range from 10 to 18, and every girl is asked to come in hungry for improvement. “Any girl that comes here is obviously taking the time and financially investing whatever it takes to get better, but those who grow fastest are those that learn — those who are humble and listen to those who have gone before them,” Mattern says. While it was certainly a winding road to get to where she is now, Mattern is in her element — back in her hometown, training young girls in the sport she loves.